Homemade chips are super easy to make and incredibly delicious. Here, seven excellent do-it-yourself chip recipes. These oven-baked naan chips are similar in texture to pita chips and are the perfect way to scoop up cucumber-yogurt sauce, mango chutney or hummus. To get perfectly thin plantain slices, use a meat slicer or mandoline. Homemade nori salt gives these crispers a great umami flavor. Peggy Knickerbocker loves these chips, a favorite recipe from the Rose Pistola Cookbook, which she co-wrote with San Francisco chef Reed Hearon. 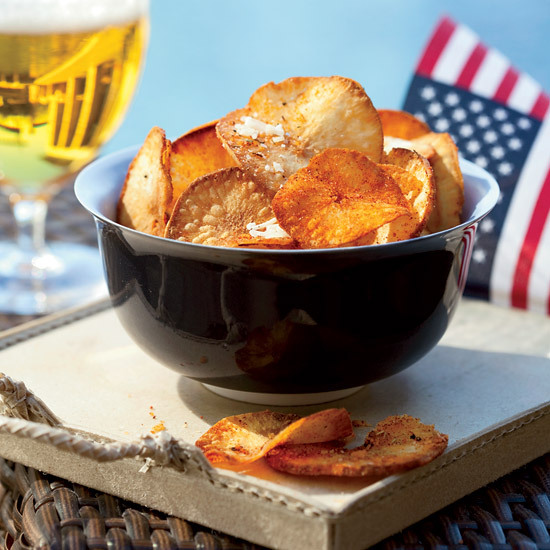 "If there's poker, you have to have chips," says Terra co-owner Lissa Doumani about these crispy fried vegetable chips that her husband, Hiro Sone, made for the poker party. The name is a play on that of the couple's Napa Valley restaurant, Terra, as well as the Terra Chips that are available commercially nationwide.